Negotiations are ongoing. Although in March 2018, the parties released a 120-page draft of the withdrawal agreement in which they set out the bulk of ‘divorce rules’, they have yet to agree on the nature of a future collaboration. The British, for their part, want to achieve the impossible: leave the Customs Union, but avoid physical borders with the EU and the ensuing customs controls – an outcome known as Soft Brexit. The UK endeavors to strike its own bilateral trade deals with the US, Canada, Australia, New Zealand, India etc., but wishes to retain frictionless cross-border trade with the EU without customs procedures. This would ideally be achieved through the establishment by the UK and the EU of a free trade area for goods. The UK believes that this would help avoid friction at the border, protect jobs and livelihood, and ensure both sides meet their commitments to Northern Ireland and Ireland through the overall future relationship. Some believe that this should be in place and actionable before the Brexit bell finally tolls at midnight of March 29, 2019. This clearly won’t happen. Nor does it seem possible that the UK could implement the necessary technicalities (i.e. a full-blown British customs, VAT and excise tax system) by that date. There simply is no time to ratify and realize it. Instead, there is to be a two-year transition period in which the EU’s customs, trade and market regulations remain in full effect while the UK is no longer an EU member. Even Brexit supporters have warned that this will reduce the UK to a ‘satellite’ or ‘vassal’ state: for the length of two years, the UK would be formally independent, but dominated by a stronger jurisdiction. Posing special problems for the withdrawal negotiations is the only land border between Great Britain and the EU, the one between Northern Ireland and the Irish Republic. Both negotiating parties agree that any final Brexit agreement must avoid raising a barrier between Northern Ireland and the Republic and protect the Good Friday Agreement made in 1998. A return to the ‘hard’ border of the past, with its physical infrastructure and border checks, must be prevented by all means. Another apparent problem after Brexit will be the cost of customs processing in the relevant harbors – especially if one thinks of the high volume of roll-on/roll-off goods traffic going on between the UK and the Netherlands, Belgium and France. According to a recent calculation made in May 2018 by the British Revenue and Customs office (HMRC) a single post-Brexit customs declaration would cost the exporting company around GBP32.50 (approx. 38 euros or $43USD). The UK National Audit Office is expecting some 200 million additional declarations per year once the UK has left the EU. And cost issues aside, seaports on both side of the English Channel seem entirely unprepared for the new situation starting in March 2019. Many of the small and mid-sized companies that currently export goods to the UK – or from it – have so far only conducted intra-European trade. Following Brexit, these companies will have to grapple with customs procedures and trade regulations for the first time. They will have to build their own customs expertise, invest in customs software, and brace themselves for the substantial extra costs involved in customs filing – duty tariff plus processing fee – payable either by themselves or by the importer. This will inflate the overall cost of their products and in many cases threaten their competitiveness. In practical terms, many exporters are best advised to outsource the actual filing to some customs agent, for instance a freight forwarder, and just supply the service provider with the relevant data. A recent study of German mid-market enterprises conducted by Landesbank Baden-Württemberg (LBBW) and the Institute for Applied Economic Research (IAW) shows that German entrepreneurs have already begun to view business relations with the UK in a negative light (see “Mittelstandsradar”, Stuttgart 2018). Some 40 percent of experts from Germany’s most significant business segment said the UK’s attractiveness as a sales market is dwindling rapidly, while more than half now see it as the world’s least desirable region for offshoring production. Any product registrations and certification marks issued by the EU, such as the CE marking, will no longer be legally valid. The same holds for existing border controls intended to maintain a high standard of consumer, animal and environment protection – they would all have to be re-legislated after Brexit. This will include new regulations for the cross-border movement of large sums of cash, firearms, explosives, narcotics and artifacts, as well as animal and plant health controls. If the UK and EU fail to efficiently collaborate on new rules, this could severely disrupt international trade. Brexit also holds risk for companies that use free trade agreements when procuring some or all of their materials from the UK. 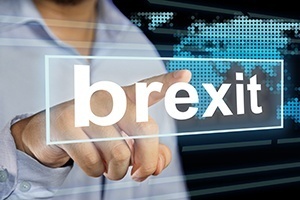 After Brexit, these organizations will have to recalculate their entitlements to clarify whether the goods in question still meet the rules of origin under the given free trade agreement. The danger here is that after Brexit – by which the British component would cease to have EU origins – such EU-produced goods would no longer fulfill the rules of origin and become subject to third country duties. Many valuable regulations and directives created during Britain’s 45-year membership in the EU, including the Union Customs Code, and many trade agreements with global economies forged in difficult negotiations will be set back to zero once the UK has left the EU for good at the end of the transition period. If the EU and the UK do not agree on some form of collaboration before this date, a ‘hard Brexit’ with a ‘cliff edge’ will be the only option. Exporters will experience a rise in costs triggered by new customs tariffs, additional management tasks, and delays in the movement of goods, and the trade volume between the UK and Germany is very likely to suffer a decline. Brexit is approaching fast and companies will experience major cross-border movement difficulties, unless necessary steps are taken. Want to learn more about preparing for Brexit? Check out our eBook, Getting Brexit-Ready in 2018!